The Grotesque Guardians is a Gargoyle slayer boss found within the Canifis Slayer Tower. 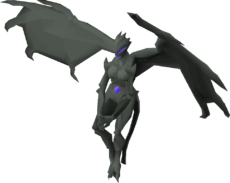 The gargoyle boss can only be fought while on a slayer task for Gargoyles or a boss task for Grotesque Guardians. They are named Dusk and Dawn, and are considered a mid-level slayer boss with a slayer requirement of 75 and an item requirement of 1 Brittle Key. The Brittle Key is dropped by regular gargoyles only while on a gargoyle slayer task, at a drop rate of 1 in 150. You only need a single Brittle Key to unlock access to the Grotesque Guardians permanently. Combined, the guardians will only count as a single kill on your slayer task, however unlocking the reward Double Trouble at a cost of 500 slayer points will make them count as two kills on your task. The most common tactic to use at the gargoyle boss is to combine both melee and ranged gear in order to take advantage of the individual weaknesses of both Dusk and Dawn. Like regular gargoyles, the final blow must be dealt with a rock hammer to finish them off. The Gargoyle boss fight takes place in an instance meaning you can only fight the boss alone and that your items will be safe on death, recoverable at a cost of 50k. Because you must fight both Grotesque Guardians at once, it’s necessary to use both melee and ranged to take advantage of their respective weaknesses. Start off the fight using the protect from missiles prayer and use range to attack Dawn down to 55% health. You should now switch to using the protect from melee prayer and start attacking Dusk with melee. Upon landing the first blow, you should immediately retreat at least 3 squares to avoid his AoE explosive attack. You can now continue to attack Dusk while avoiding the falling debris until Dusk also reaches 55% health. You will now be under attack from both Dusk and Dawn at once. Switch back to your range gear and use the protection from missiles prayer whilst attacking Dusk. She will occasionally fire out three healing orbs, which you must click on and absorb the energy from these orbs as soon as possible in order to avoid Dawn absorbing health from these orbs. You must now finish off Dawn with your Rockhammer. Once Dawn is dead you can now switch to your melee gear and use the protect from melee prayer. Focus now on finishing off Dusk. He will occasionally use a special attack where he teleports the player inside a 3 x 3 square surrounded by fire. You must escape this square through the open gap in the wall before you are hit and take massive damage. Finish off Dusk with your Rockhammer and you’re done. The Saradomin Godsword is a good special attack weapon as it will help extend the length of your trips by providing health and prayer restoration, but you can swap it out for any other decent special attack weapon of your choice, or simply use the special attack of the Blowpipe.